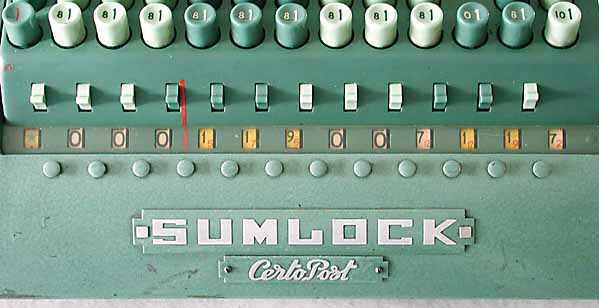 SUMLOCK model 913/CP/S Sterling currency "Comptometer" fitted with "Certopost" verification device. This is a full-keyboard direct action calculator of the "comptometer" type for Sterling currency calculations and is identical to the model 912/S/4AH/120.260, pictured below, except this machine is fitted with the "Certopost" verification device, distinguished by the extra column of 6 keys on the far right. Manufactured from 1955 into the 1960's. The machine illustrated has serial number 913/CP/S115.073. It is important when producing invoices that the prices are calculated correctly. The "Certopost" verification device was developed for verifying the calculations. The Certopost includes the extra column of 6 keys on the far left, and extra red numbers under the normal black numbers in the result windows. Each item of goods is given a code number depending on its price, and a further calculation is performed on the code number to verify the original calculation, as described below. This photograph shows a similar, standard, machine without the Certopost keys. The result windows. Unusual on this machine are the small red Certopost numbers below the normal black numbers, and the green star in the far left window. The keyboard, showing the columns of keys. In checking invoices, accounts or sheets of figures of any kind, the wise accountant strives to get the checking done on a basis of computation different from that used for the original work. Doing a job in the same way a second time, it is so easy to make just the same mistakes! To ensure that checking is done a different way an ingenious device has been evolved by Sumlock Ltd. Known as the Ccrtopost, it can now be built into three of the standard adding-calculating machines made by this firm. The Certopost device employs what is aptly called the Duarithmic method; it enables all computing errors to be located at source so preventing them burrowing themselves into the main accounts, where they are so much more difficult to rectify. In testing a Sumlock machine fitted with the Certopost, we found that no additional skill was needed; any machine operator should quickly be able to learn the new principles involved. No trained accountant is needed to supervise checking work once a Certopost is in operation. 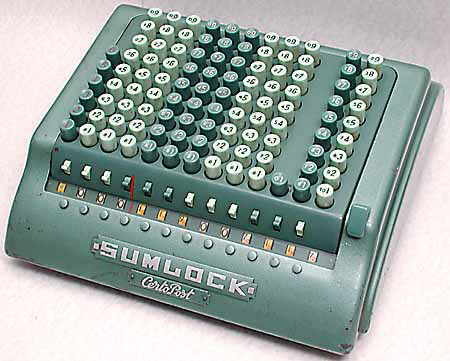 Many readers will know that the Sumlock is a manually-operated key-drive model and that it will perform four arithmetical processes. Models are available with or without farthings [1/4 penny], with a currency or decimal keyboard and with 9, 10, 11 or 12 figure capacity, giving answers with 10, 11, 12 or 13 figures respectively. When the Certopost device is included, there is a further bank of six keys on the left side of the keyboard, the function of which we will now explain. Before using the Certopost device every priced item with which the office is concerned is given a code number; this number (obtained as explained below) accompanies the price wherever it is used. In the dial space, below the keyboard, two figures appear—a black figure, which is the normal value or number of the key depressed, and a smaller figure in red. This red figure is a set figure for individual keys according to their position on the keyboard. To arrive at the code number for a particular price the red figures are added across the dials; the total is the code number. If the price of an item is 8s. 11d. this sum is entered on the machine by depressing the 8s. key, in column B, and the keys totalling 11 in the pence column, A. By adding the red figures that appear on the shilling and pence column dials we arrive at the code number for 8s. 11d., which is 7, This figure now becomes an integral part of the records; wherever 8s. 11d. is used, so the code figure 7 appears alongside it. 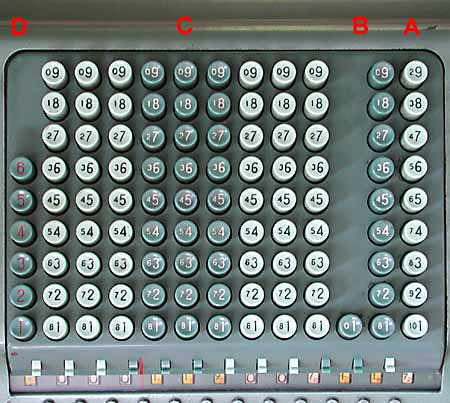 On the six keys on the left side of the machine (row D) the red figures 5, 7, 5, 12, 12, 9 and 2 are then set up – with the result that a green star appears in the answer dial below row D.
The appearance of the green star proves that the goods have been priced correctly and that the extension has been calculated correctly. Again the red figures are set up on the extreme left-side bank [D], but now, instead of a star appearing the figure 3 is seen in the left-hand answer dial [column D], so indicating that an error has been made. Were any other figures to appear, an error would be indicated. Only when a green star shows has the original calculation or entry been made correctly. When a number of items appear on an invoice, as on this one, checking is carried out by accumulating the items into the machine. The total is added on the £ s. d. keys, while on the key-bank C, the quantities are multiplied by the code numbers; the machine automatically accumulates the answers. As previously, the red figures are set up in column D and the green star will appear in the answer dial—proving that all the items have been calculated correctly and the invoice added correctly. Briefly then, the capabilities of the Certopost have been outlined. These simple examples do not represent the only applications of the machine. Decimal entries, fractions, weights and measures can be calculated and checked with equal ease. Certopost can now be incorporated into three of the standard machines made by Sumlock Ltd, They are the Sumlock, costing £185 [about US$520] complete; the Unilectric at £235 [about US$650]; and the Duolectric at £325 [about US$900]. Any of these machines can be rented on a two-year or five-year basis if desired. An excellent feature of the Sumlock series is the keyboard. The keys are large and easy to operate on all models, yet all the machines are compact, portable and can be stowed away when not in use. The additional cost of the Certopost is £40 [about US$110], a sum that can soon be saved in the economies made in the considerable time that is often spent on checking. Particulars about further applications of the Certopost are available from Sumlock Ltd. at 1 Albemarle Street, London, W.1.